Finishing kits include all interior seating, motorman's control platform, step wells, wind guards, fare box, retreiver, trolley pole(s), pole hook(s) and Universal Life Guards or Tomlinson Couplers (except as noted). The listing shown is by no means complete. It is intended as a guide. Keep in mind when installing seats that the standard distance of the seat-front to seat-fron is 28 1/2 inches. This was true for sinfle and double seats. However, some adjusting to this dimension will be necessary as most PCC interiors are NOT full scale. Omit the two striped seats as the Washington DC PCC cars were one window shorter than all other PCCs. 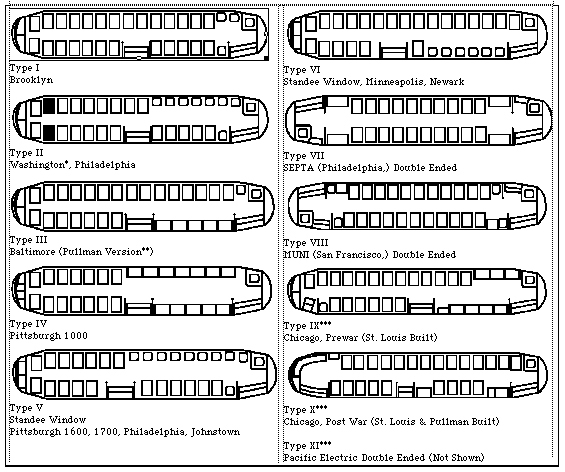 **On St. Louis built Baltimore cars the long bench seats were replaced by six single seats. ***This set does not contain step wells, retreivers or Universal Life Guards. For complete information on all your ordering options you can go to our Ordering page. Our email address is: contact@qcarcompany.com. Or you can use the links above to navigate the rest of the site.